The Vibe CMS is a new product designed specifically with ease-of-use in mind. With a simple interface and easy to use navigation, this product is great for users who have little or no technical experience. 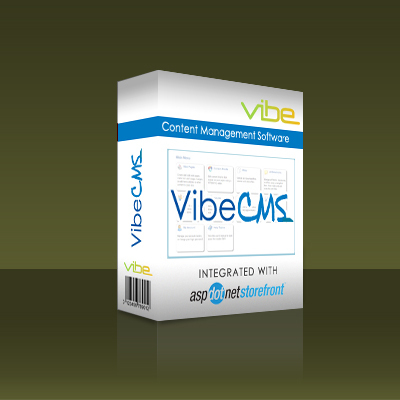 With a rich web service API and robust feature set such as workflows & triggers, the Vibe CMS can assist ASP.NET developers in building a CMS solution that is fully integrated with the client's website. Compatible with versions 9.0 - 9.5.1.0 available now! Can be used with version 8 under special circumstances, so please contact us if you would like to use with this version. Surf & Edit Designer. Use the designer to visually edit sections of a page. Robust WYSIWYG Editor. Market leading editor requires no HTML experience. Forums & Blogs. Create and administer blogs, forums, and message boards. Interactive Calendars. Use a drag & drop calendar to create events. Workflow. Build customizable workflows for pages and documents. History & Rollback Points. Maintain a history of changes and rollback to previous versions. Document Permissions. Assign permissions to documents and web pages to restrict access. Manage Users & Roles. Administer users and roles for the CMS or your website. Template Driven. Build web pages based on templates for consistency. Fully compatible with ASP.NET Master Pages. Integrated with ASPDNSF*. Manage your content and SEO with all the power of a content management system without having to give your content editors access to your ASPDNSF management console. Take a look at the Demo of our CMS Connector to ASPDNSF here! *: Product does not include ASPDNSF license.